When cheeses are made by putting pressure on the milk ("Hey there, milk! Turn into great cheese, now! Hurry! Come on, you can do better than that! "), what comes out is the dairy byproduct whey. In French, it's called lactosérum, and is also referred to as sérum or simply petit-lait ("little-milk"). The lactosérum is then heated, and some salt is added. The texture becomes soft and silky and is high in fat. In areas where there is often scarcity, this is a common practice. The scrubby, remote island of Corsica is a perfect candidate for this. Brocciu Passu is a raw sheeps' milk cheese made in Corsica and is, as you might have guessed, a lactosérum cheese. It's one of the representative, classic cheeses of Corsica, and has had its AOC since 1983 (and AOP since 2003) -- under either Brocciu or Brocciu Corse (or Brucciu). Frankly, my favorite cheese store appears to be spelling-challenged in general, so I actually see it as Broccio, but it's the same cheese, sometimes also nicknamed the Corsican "national cheese". To give you some idea why it would be called this, early on in my cheese-tasting, I was in a cheese store and wanted to confirm that a cheese was, indeed, eligible for my Year in Fromage. I asked, "Is this French?" and received the very serious answer, "No, it's from Corsica." Since Corsica is officially part of France, I consider this quite a legitimate cheese for my French-cheese-only blog, but some Corsicans may well feel differently. It's also an old cheese. At the end of the 19th century, author Emile Bergerat wrote "He who has not tasted it doesn't know the island [of Corsica]." It's a mild cheese, especially when very young and fresh. And creamy -- that practically goes without saying. Just look at it. It's generally made between October till June, and sheep milk is added back to the extra whey in order to fatten it up. It used to be made with wicker baskets, but can no longer be made that way because it doesn't conform to European norms for commercially sold cheeses. 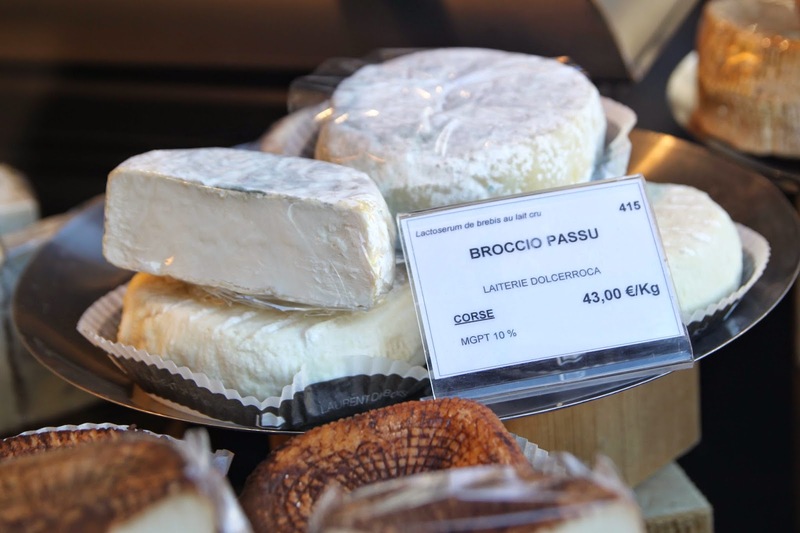 Brocciu can be sold either very fresh or with the surface slightly salted and washed and aged at least three weeks, in which case it is known as Brocciu Passu, as is the case with the sample I try in Paris. This makes sense, as even the slight salting and washing, which creates and ever-so-slight-crust, makes a fresh cheese much easier to transport long distances. It's so light and fresh, especially when eaten locally, it's often eaten with figs, but then it's also eaten in savory dishes like soups. The more aged Brocciu Passu tastes stronger and goatier than the fresh version. Brocciu may just be the most famous of Lactosérum cheeses. It's certainly the one the Corsicans are most proud of!